The prequel to JUPITER'S LEGACY is a book about relationships and politics set in a time when the superhero genre looked at them barely at all. Certainly no hero left his wife and children for a star-struck teenager then attempted to recommend her as a new superheroine to his teammates. Also, back in 1959 cinema's greatest heroes were all in the closet - because, umm, public opinion and box office...? But also: illegal. Yes, it was illegal to love if you were a bloke and your loved one happened to shave too. Insane in the brain - what a bunch of myopic muppets we are when we promote hatred and division over diversity and love. Millar dealt with all that beautifully, intelligently and unflinchingly in JUPITER'S CIRCLE VOL 1 while here he wonders what would true altruists - respected by the public and with the capacity to intervene - do when faced with the Los Angeles Watts Riots of 1965? When confronted by images on the television of young black men, understandably angry and disenfranchised after years of economic deprivation, being manhandled by white policemen? For example. The very motivation for this extended 'family' back in JUPITER'S LEGACY VOL 1 was economics following the Wall Street crash when Sheldon Sampson set about giving America something to believe in and people to give them hope: superheroes. A generation later what transpired was disastrous, but even this early on there is duplicity within this family of friends and I really am doing my best to avoid spoilers. It is a very different beast to JUPITER'S LEGACY, but equally deserves your attention because reading one informs your understanding and so appreciation of the other, and it asks imaginative questions of its own. 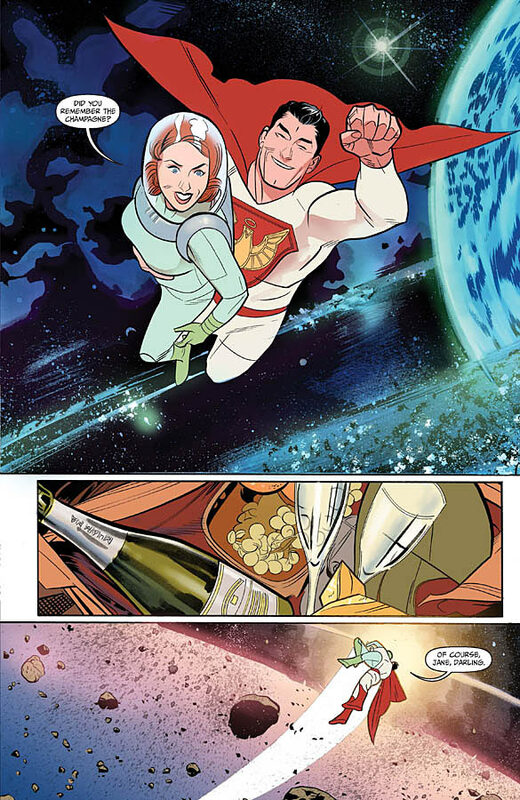 What might the love life be like of a kind and considerate man with the ability to fly far out to space, when he is absolutely besotted by and dedicated to his loved one? What mountains might he move? There's plenty of room for old fashioned romance here - examined thoughtfully from both perspectives - but not necessarily for everyone, so I'm afraid there's room for much sadness too. Also touched on: the balance of power between humans and metahumans Lex Luthor-stylee, questions about what it might mean for future generations (oh, the dramatic irony!) 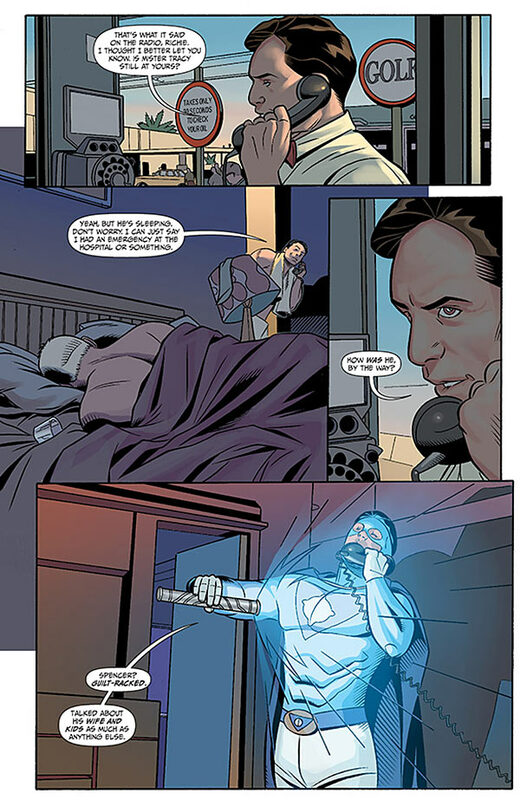 and what might a man do in search of a super-powered son or daughter. For me both series are Millar's meatiest works since SUPERIOR, this one sharing its vulnerability and poignancy. 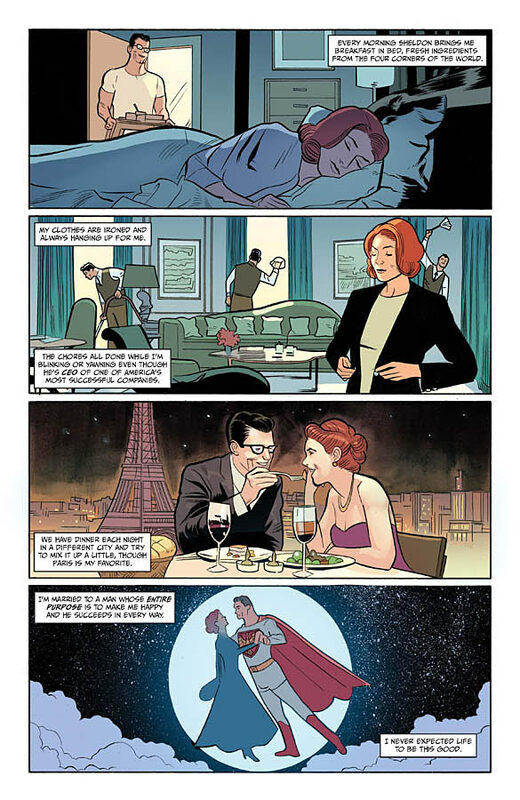 I talked about the art in a little more detail in JUPITER'S CIRCLE VOL 1 with was perfect for a piece set in a period where superheroes were seen more innocently and written an emotional naivety. 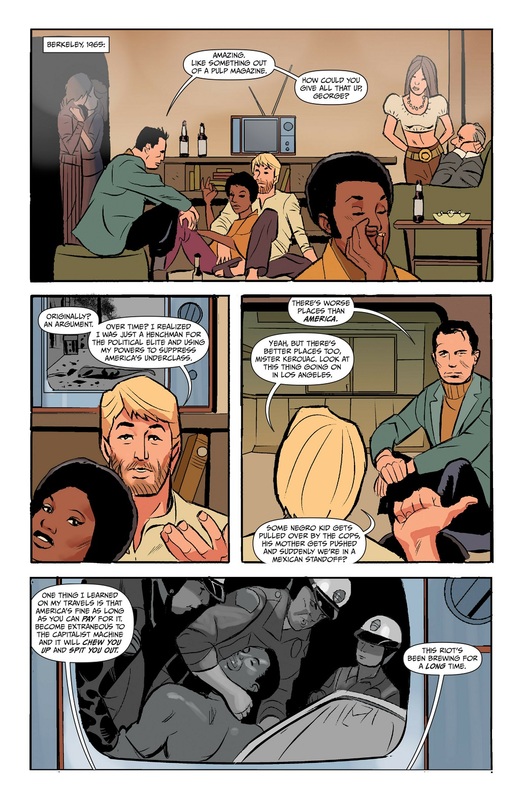 It's mostly on target here too with Torres depicting the Utopian as a young Ronald Reagan but, in the interests of honesty, there are half a dozen pages by a fill-in artist which jar horribly, unnecessarily. Real-life guest appearances this time by Ayn Rand (see SUPERCRASH) and Spencer Tracy!